Rain and Sun Solo Dinghy Covers are manufactured in heavy duty, high grade, U.V. resistant, P.V.C. coated polyester for long life. Rain and Sun Solo Covers are tailored for an accurate fit. All necessary fastenings, including release buckles webbing nylon quick and under hull straps are supplied. Solo Dinghy Covers are held in stock. Others we can manufacture within a week. We produce Long life, UV Protected, Waterproof, All weather and Anti fungicidal Solo covers. 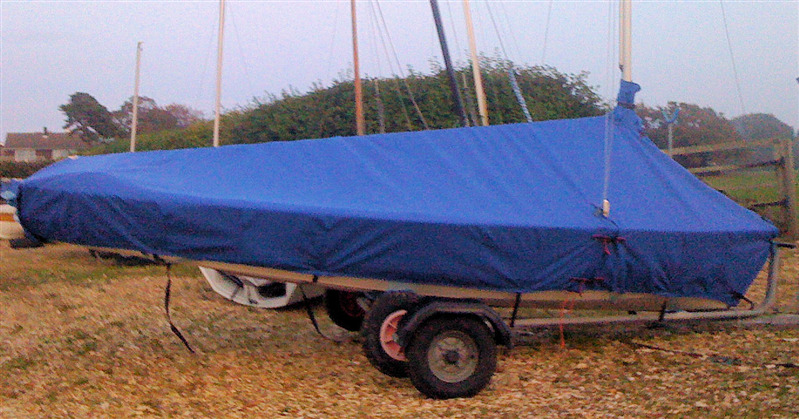 We also manufacture the full range of Solo Dinghy Covers in breathable cotton/polyester. Solo Dinghy Covers can be purchased in a wide variety of material and colours from Acrylic canvas, cotton duck canvas, pvc polyester, pu coated polyester and nylon. We are very aware of the importance of keeping your Solo Dinghy well protected when it is not being used, and have designed our covers accordingly.